"A feast of joy and gladness is revealed to us today, for the teachings of the true faith shine forth in all their glory, and the Church of Christ is bright with splendor, being adorned with the holy icons which have now been restored; and God has granted unity of mind to the faithful" (Matins, Prosomoion of the Praises, Sunday of Orthodoxy). It is also a day of the remembrance of our Holy Fathers and Confessors, who did not join with heresy and political power by which was appointed ecclesiastical power, but they kept, confessed and handed down the Orthodox faith, undergoing persecutions, imprisonments, torments, exiles, public castigations, humiliations and eventually many of these ended up in martyric deaths. "These preachers of piety, we praise as brothers and as those we long to have as our fathers, to the glory and honor of the piety for which they struggled, and say: Germanos, Tarasios, Nikephoros and Methodios, truly high priests of God, who taught orthodoxy and fought for it: May their memory be eternal!" (Synodikon of Orthodoxy). Subsequently Metropolitans, Archbishops, Abbots and Monks who were Confessors are declared blessed. Favorable also are Orthodox emperors, and those who became monastics and exchanged the earthly Kingdom for the Heavenly. But the Church does not want to forget those heretics that fought her Truth. She subjects them to anathemas, following the words of the Apostle Paul: "If anybody is preaching to you a gospel other than what you received, let them be under anathema" (Gal. 1:9). 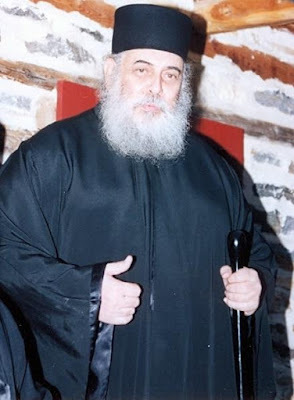 It is very unfortunate that members of the Church (Patriarchs, Bishops, Priests, Abbots, Monks and Laity) preached heretical teachings, and tried to impose them on the Church and lured a multitude of souls astray. They made human words into divine words. They considered the Revelation and Theology of the Church to be the basis of worldly wisdom, while they should have judged philosophy by the criteria of disclosed Truth and Theology. Thus they removed themselves from the Orthodox Faith and hence from the Church herself. The "anathema" was their own choice. The Church publicly pronounces anathemas, to protect the Orthodox flock from the indignities and pitfalls of the heretics. Hence the pronouncements of the anathemas have a pedagogic character and they should not be skipped when reading the Synodikon on the Sunday of Orthodoxy due to alleged philanthropy. The proclamation of the Orthodox Confessors as blessed and the anathemas of the heretics make everyone cautious, so that we do not fall into heresy, whether old or new, and lose our salvation. They even help the flock maintain doctrinal sensitivity. It is known that the Pastoral Theology of the Church is always based on doctrine and theology, as we also see in Worship. A non-doctrinal, non-theological moralistic Pastoral Theology is responsible for the indifference and ignorance of our faith from a portion of the fullness of the Church. It is comforting that the Diptychs of the Church of Greece include for the first time the anathemas against the heretics. This is a very good action, which brings the Church into a truer experience of Orthodox Ecclesiology. A similar correct action is the issuing of a detailed Encyclical of the Sacred Synod on the Non-Transmission of the Divine Mysteries to the Heterodox. "Through the dogma of infallibility the Western Church lost spiritual freedom, it lost its adornment, it profoundly strayed, it was left without the grace of the Holy Spirit, the presence of Christ; from spirit and soul it became a dumbfounded body." The essence of secularism is anthropocentrism. Conversely, the essence of the Church is Theanthropocentrism. If the Church lost its theanthropocentric character, it would be reduced to a religious institution or one of the religions of the world. The secularized man accepts the Church as one of the religions of the world, but not as the only Truth that saves man in Christ. With this aim in mind, they are trying to equalize our Orthodox Church with other religions. This is leading to a pan-religion through the cooperation of all religions. The aim is not the Truth that saves, but worldy peace. Of course, such a pursuit suits the rulers of this world, who want their people subject to their sovereignty and through the cooperation of religions to have peace (sedation). For the sake of peaceful coexistence, the Orthodox in interfaith meetings do not confess Christ. They tolerate the Church being classified with monotheistic religions like Judaism and Islam. But it is a fundamental teaching of the New Testament and the Holy Fathers that to not believe in the Triune God and the incarnate Word of God is atheism. "Whoever does not honor the Son does not honor the Father, Who sent Him" (Jn. 5:23). "Whoever believes in the Son has eternal life, but whoever rejects the Son will not see life, for God's wrath remains on them" (Jn. 3:36). According to Basil the Great: "Whoever does not believe in the Son does not believe in the Father" ("On the Holy Spirit", P.G. 32, 116 AB). By not confessing Christ the Orthodox injure themselves, because they lose their Orthodox confession. The Lord expressly said that "whoever acknowledges Me before others, I will also acknowledge before My Father in heaven" (Matt. 10:32). "Many of these Martyrs had mercy towards the loss of those of other religions, and went to their martyrdom proclaiming the truth, teaching them to abandon the darkness which they were in, and run towards the light of divine-reverence and faith in Christ, that they may not be condemned to the unquenchable fire of Hell. But these unfortunate ones were blinded by the dark lord of this age, and their passions, and were unable to open their noetic eyes and behold the truth of the Gospel, and the faith of the Christians, as Paul says, 'The god of this age has blinded the minds of unbelievers, so that they cannot see the light of the gospel that displays the glory of Christ, Who is the image of God' (2 Cor. 4:4). Hence they are left without excuse on the day of judgment, for the preaching they heard from these young Martyrs, and having seen so many terrible martyrdoms, and the wonders of God they saw through them, they did not believe, but remained in darkness. 'They were blinded by their wickedness, and did not understand the mysteries of God' (Wisd. of Sol. 2:21-22)." Thus, this is how the Holy Martyrs understood the words of the Lord, the ancient ones and the new ones, as well as the Holy Fathers Photios the Great, Gregory Palamas and Gennadios Scholarios, who while in danger of their lives dialogued with Muslims and confessed Christ as God. There are other consequences of the Orthodox participation in interfaith and interreligious meetings. The faithful Orthodox are scandalized seeing their shepherds intermingling with various representatives of other religions, even pagans, and especially when symbolic acts of worship take place, such as lighting candles to the God everyone believes. And the indifferent and lukewarm Orthodox consolidate in their deceit, that all religions are the same. Thus, religious syncretism is promoted, especially through the influence exerted by the media, which showcase these interfaith conferences. With the restoration of the icons our Church continues to be revealed as a community of people in Christ. The monophysite Iconoclasts have not prevailed. The person (hypostasis) of the Word of God, who assumed perfect human nature to unite it with His divine nature, is still the center of our faith and the ornament of our churches. The person of our Lord surrounds the faces of the Panagia and the Saints. Each believer in the Church is saved as an individual. The Church cannot eventually become an ideology or religion, like the secularists want. The Iconoclasts abolished sacred icons, revealing the Church as a community of indivudals and so they help the members of the Church become individuals, images according the image of God the Father of our Lord Jesus. The prototypes of the Iconoclasts were the Jewish synagogues and Muslim mosques. Of course the Iconoclasts viewed the Orthodox as fanatics, idolaters, extremists (or with the more modern term of fundamentalists). But the "fanatic" iconophiles delivered to the Church and the world not only the ability for Christians to operate as individuals, but also the unique art of ecclesiastical painting. One wonders with today's syncretists who today are associated with the spirit of the iconoclasts, what would theology and culture have if the Iconoclasts prevailed? The Iconoclasts were the secularized Christians of their day. The Church with its bloody struggle repelled them. The same must be done today. The shepherds and pious people must keep with a vigilant conscience our faith pure from every form of secularization (such as pan-religious syncretism, doctrinal minimalism and pluralism). The Holy Spirit that exists in the Church, always directs us to all Truth and the Church, despite the storms of human passions and heretical deviations trying to sink it, and it continues its voyage to the unruffled port of the Kingdom of God. Source: From the newspaper Χριστιανική, 27 March 2003. Translated by John Sanidopoulos.